Secured in the Orbiter Processing Facility after her successful STS-133 mission, space shuttle Discovery is prepared for decomissioning and display at the Smithsonian Institution. 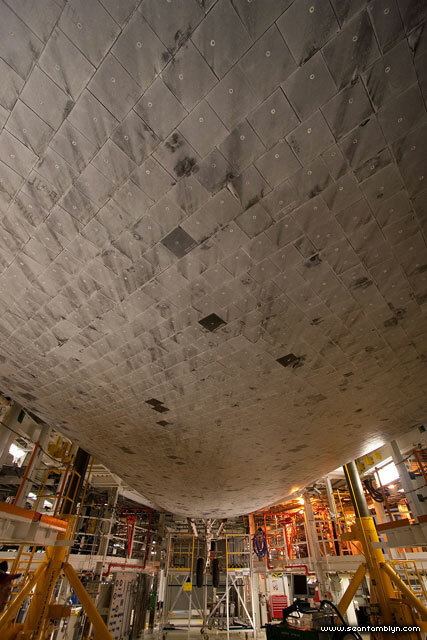 Underneath Discovery and looking forward from roughly amidships, the orbiter’s Thermal Protection System tiles stretch forward toward the nose landing gear. This entry was posted on Saturday, January 14th, 2012 at 4:12 pm. It is filed under Areas, STS-133 Discovery, The Space Shuttle Project and tagged with Canon EF-S 10-22mm f/3.5-4.5, Canon EOS 20D. You can follow any responses to this entry through the RSS 2.0 feed.